See you in September? Sneak peek at our auction items and draft program! As promised, a sneak peek at our golf tournament draft program! To see it, click here: FOKN GOLF program. Why are we sending it early? To allow you to feast your eyes on the great auction items we have, which may help change your mind if you are still on the fence about attending! If you’d like to register, go here: http://www.eventbrite.com/e/fokn-golfin-2015-tickets-15593108407. Can’t golf? Join us for lunch! Reminder: ticket sales end on September 5! To note two wonderful additions to the live auction items — a hotel stay for the It’s Always Sunny Visit, and an upgraded Travel Advantage Network stay (and we may have a trick or two still up our sleeves). To let you know all the silent auction items we have in hand. To encourage you to plot your bidding strategy. If you will not be in attendance but see something you like, get in touch with someone who will be there! Or, if you see a live auction item and know your maximum bid, get in touch with Chris Neary (nearyc@gmail.com). Does the program draft include everything? Of course not! Those who participate in the raffle might win the 50/50; or might win fine “consolation” prizes like a STARBUCKS gift basket or a DIXON golf prize. This year, for the first year, golfers will have the option to participate in a $10 DIXON hole in one challenge. DIXON staff will be at the course to run the event—it sounds fun, with some great prizes! We are OVERWHELMED by the generosity of so many, and by the hard work of the committee. Will we see you in September? As we gear up for our event on the 21st, a reminder that sales end on September 5! With over 100 tickets already sold, there is no time to waste. Last week, we told you about our live auction items for Kevin’s September 21 golf tournament. Today, we feature some pictures of SILENT auction items our friend Mike Pierce is donating. We thank Mike, and predict some out of this world bidding. We’ll post a draft program at the end of this month, but thought these great items were worth a special salute. We have special events, restaurants, jewelry, sports, great golf gifts, and so much more coming in. Start thinking about your bid strategy now! 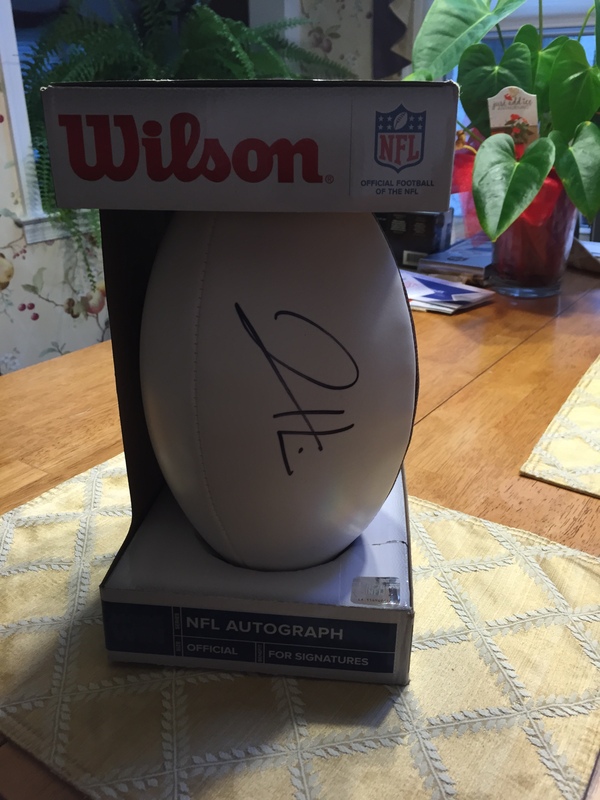 A regulation-sized signed football by star Bengals running back Jeremy Hill with a certificate of authenticity. 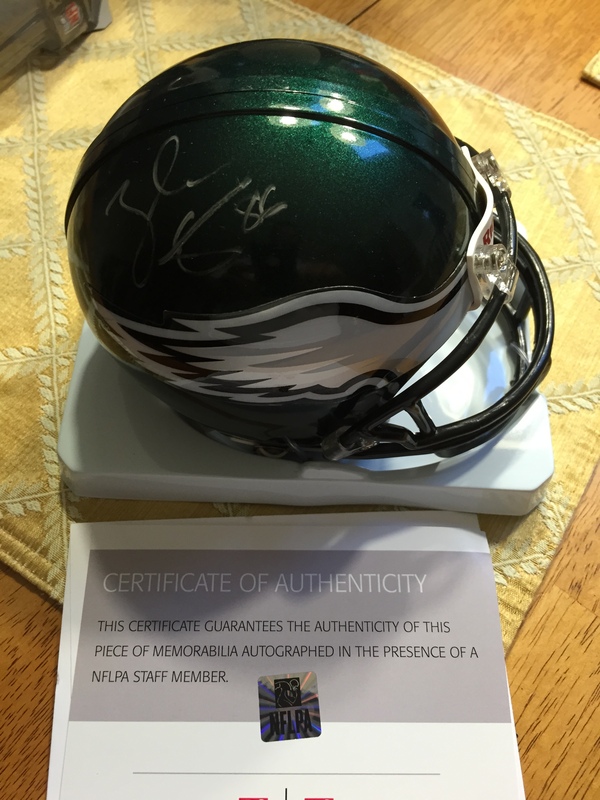 Authentic Mini helmet signed by current Eagles star tight end Zach Ertz with a certificate of authenticity directly from the NFL Players Association. 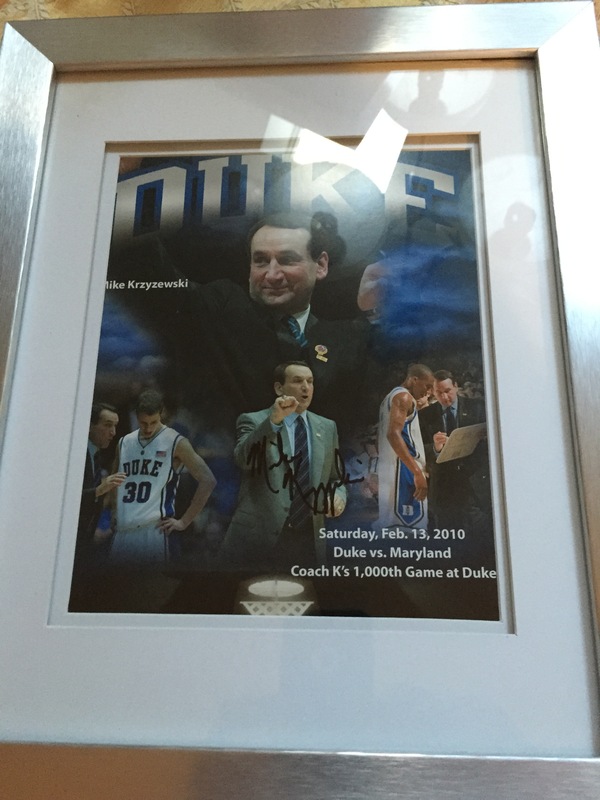 An 8×10 framed, signed game day giveaway commemorating NCAA Basketball Championship Duke University Coach Mike Krzyzewski on the occasion of his 1,000th game at Duke University on February 13, 2010. The card was personally signed by Coach K in black sharpie in the center of the picture of him coaching during a game. Our family’s journey with Kevin has led us to some incredible people, and incredible stories. We thought you might be interested in this one. Our friend Mike Possenti is a great supporter of Kevin’s, and fellow Salesianum alum,–he reached out a few days ago to confirm that he is donating golf towels to our September 21 golf tournament. He didn’t mention the health and financial crises he is facing. Mike was diagnosed with diabetes at age 11. In November of 2011, Mike broke his foot, marking the beginning of his health problems. Soon after, his kidneys began to fail and he was on dialysis 4 days a week. He lost his right leg in August of 2012 due to the disease. In October 2013, Mike had a kidney transplant. But the following July, Mike’s left leg was amputated; he now needs another prosthetic. 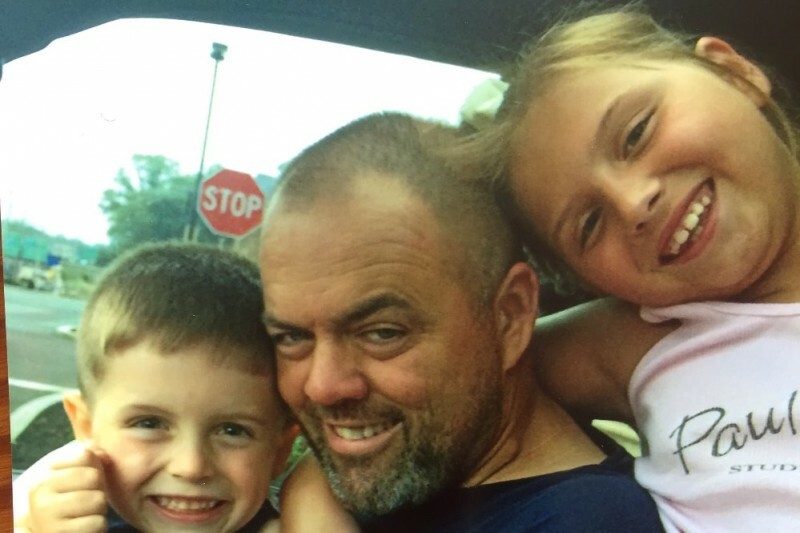 Mike is a single dad with two great kids and his health care costs are mounting. If you are interested in reading more about Mike’s struggle or wish to make a contribution, please visit: http://www.gofundme.com/wbkgzfw4. announcement – especially for fans of It’s Always Sunny in Philadelphia. Only fifty one days – just 7 weeks and two days – until the third annual Friends of Kevin Neary Golf Outing on September 21st! And, more importantly, just thirty six days (five weeks and a day) until signups are closed on September 5th and we need to give the golf course our head count. If you have signed up already we thank you, and ask that you contact Bill Burland at burlandbill@gmail.com as soon as you have your foursome together so he can make his arrangements for the course. If you haven’t signed up, please do so as soon as possible. We have over eighty golfers signed up and commitments from about twenty eight to thirty two more. With a field of one hundred and twenty spots room and opportunities are going quickly. Register now and don’t get shut out. Amazing Auction Item Announcement – even if you’re not attending the tournament! We just got word of another stellar donation that’s going to get a bunch of you excited. 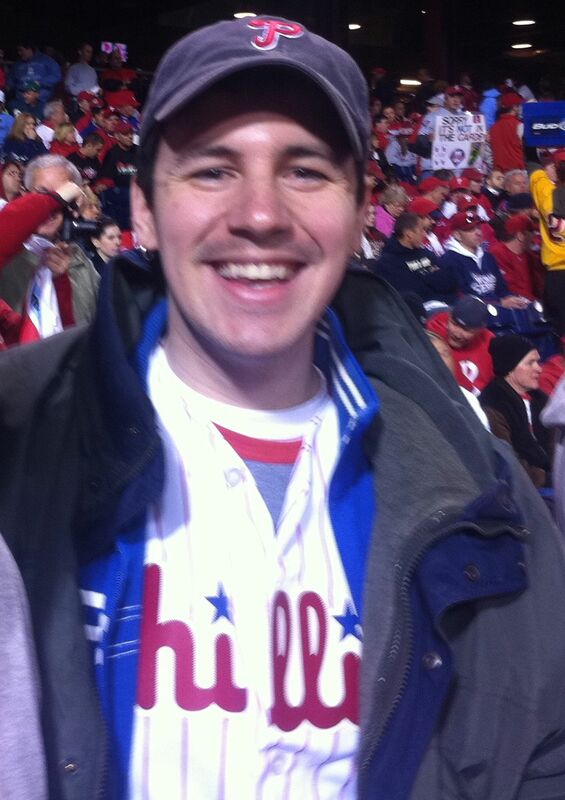 It’s Always Sunny in Philadelphia – a great friend to the Nearys – has donated an LA set visit to the tournament! This will be one of the several live auction items at the tournament. If you’re interested in this or other live auction items and can’t attend the tournament, you can either ask someone who is attending to be your bidding agent, or you can get in touch with Chris Neary (nearyc@gmail.com) to discuss what you’d be willing to bid so you can be part of the action. Other live auction items include: (1) four club level tickets, pregame field passes and a parking pass to the October 11th Eagles game against the Saints; (2) tickets to the Army Navy game; (3) four clubhouse passes to the 2016 Quicken Loans National tournament at Congressional Country Club; and several more. Silent auction items include: (1) Four weekly passes to the Farmers Insurance Open at Torrey Pines; (2) brunch at the Mendenhall Inn; (3) tickets to Philadelphia college sports games; (4) a signed mini-Zach Ertz helmet; (5) a Rickie Fowler signed cap; and many more! Of course, there will be a Wawa gift basket to bid on! If you’re not a golfer, but still want to come, you are welcome to join us for lunch! And now what you’ve all been waiting for…an update on Kevin! More importantly, here’s a quick update on Kevin. Kevin has been enjoying the summer with no major health issues clouding the picture. He’s been going to Phillies games (he’s 4 and 3, way better than the Phils), going to lunch and/or dinner with friends, going to a party or three, and having visitors stop by to discuss the Phils, Sixers, and Eagles. Kevin looks forward to the visits and the door is always open. We encourage you to call ahead to make sure we’ll be here as we often have appointments with doctors or with Kevin’s good friend, Handsome Joe, who cuts Kevin’s hair in the city, or going to a Phillies game. Kevin hopes to get to some Sixers games this fall so the schedule will hopefully get fuller with activities. We do have four or five more Phillies games on Sundays including August 2nd as well as the business person’s special this Thursday to see the Dodgers and Jimmy Rollins. Let’s hope they continue to play well. Finally, Kevin is looking forward to attending a wedding in August as his high school friend Rob Treml is getting married on the 22nd.